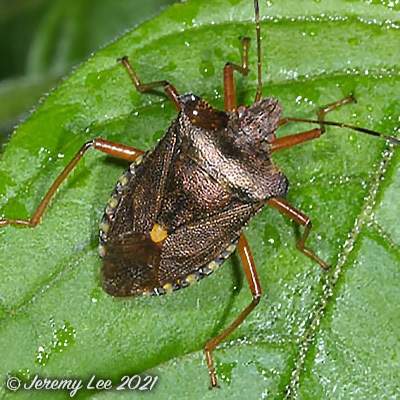 With a length of 11-14 mm, Pentatoma rufipes is a large brown shield bug, in the family Pentatomidae, which has orange legs and slightly hooked projections at the front of the pronotum. The noticeable pale spot at the tip of the scutellum varies from orange to cream in colour. This species overwinters as a young nymph, which feeds mainly on oak. Alder, hazel and other decidous trees are also used, including apple and cherry. Adults are partly predatory, feeding on caterpillars and other insects as well as fruits. New adults may be found from July onwards, surviving until the late autumn, and eggs are laid in August. Adults can sometimes be found in the early spring, suggesting that a secondary breeding cycle may be possible. Widespread and common across Britain in wooded areas, orchards and gardens.